The in-house marketers who are personalizing their web experiences see, on average, a 19 percent uplift in sales. About 94 percent of customer insights and marketing professionals across multiple industries suggest personalization is “important,” “very important,” or “extremely important” for meeting their current marketing objectives. Identify the segments to target. Measure success from personalization efforts. Segmentation begins with knowing who your visitors are and segregating them into different segments, based on certain traits or characteristics. Google Analytics, for example, is a great tool to help you do that. You can slice and dice your visitors’ data, based on various attributes to identify segments that drive significant traffic to your website. Further, Google Analytics can give you a lot more than just traffic numbers. If you have “revenue tracking” in place, you can identify specific segments that bring you the highest conversion rate as well as absolute sales figures. These are the segments you should be targeting. If you have a CRO program in place, you can also look at the past A/B test results to identify segments that you might want to target. Run post-test segmentation and drill into the results to look at individual segments that won higher conversions, or find hidden winners. For example, you could run post-test segmentation and find out whether social traffic got you more conversions compared to direct traffic. While demographic and psychographic information is important for consumer marketers, firmographics are used by B2B marketers. You can extract psychographic information by using website cookies. On the other hand, you can ask users directly for firmographic and demographic information. 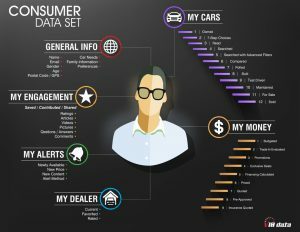 For instance, the following image shows an ideal customer profile for an automobile website. It lists important information which is required for creating profiles of target customers—demographic information of the users, the type of engagement shown on the website, and the type of products they intend to buy or already own. Enterprises also need to understand why it is important to target a certain segment. Is it that the segment that they want to target drives the major share of revenue for your website? Target your most valuable visitors to achieve your personalization goals. If an eCommerce enterprise observes that people in their mid 20s account for 70 percent sales of their sports equipment, it could run a campaign for that segment showing a separate section devoted only to sports goods on the home page. B2B marketers can target segments per industries such as healthcare, BFSI, or government. These segments can be targeted by either offering a product with personalized messaging or offering different products to different segments. Enterprises can also run personalization when they have a segment-specific business goal in mind. For example, if the objective is to increase hiring from a specific region, visitors from that region should be targeted with a personalized message or content on the website. Here’s a case study on how geo-targeting helped VWO increase the CTR to its careers page by 149 percent. Similarly, if an eCommerce enterprise that caters to global markets wants to introduce a new product for a specific region, it can run personalization on its website for visitors from that part of the world. One message does not fit all. For instance, an eCommerce enterprise can target two different subsegments from a certain main segment, that is, women aged between 20-30. The first subsegment can be of “fashion-conscious and impulse” buyers. The other subsegment can be of those women who make only carefully thought-out, high-end luxury purchases. Both the subsegments drive a large percentage of sales to the accessories section of your website. User behavior information such as “number of sessions to transaction” by using cookies can help classify users into these segments. An impulse buyer would complete a purchase within a single session, while a carefully thought-out purchase might take multiple sessions before a visitor converts. For the first segment, you can run personalized cross-sell campaigns on products for which they show the intent to purchase. For the second segment, consider targeting a lookbook that shows how your high-end products such as platinum/diamond jewelry can seamlessly blend with their outfit and add a charm to the wearer’s personality. Here is another example. A B2B software company first might want to show a basic product video to a first-time visitor on the website. Later, the company might target a one-to-one live product demo offer to someone who has visited the site multiple times and looks highly engaged. 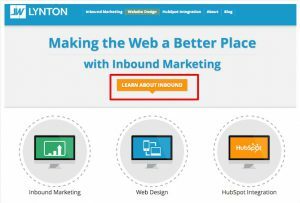 A Hubspot post which lists 3 examples of personalization, talks about how Lynton personalizes its home page for new and repeat visitors. 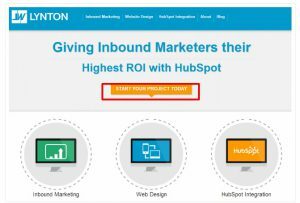 The CTA on the home page shown to first-time visitors says “Learn About Inbound,” while the CTA for repeat visitors reads “Start Your Project Today.” Hubspot’s hypothesis behind running this personalization campaign could be that while new visitors might be interested in knowing more about inbound, the repeat visitors might already have explored enough on inbound and now need to start their learning. With the goal of increasing clicks from both new and repeat visitors, they showed personalized CTAs to both segments. Another widely used method is geo-targeting visitors from different countries, using their native language. A post on QuickSprout talks about how Neil Patel increased search traffic by 47 percent by translating his blog in 82 languages. After identifying the segment, you should target and craft a messaging strategy for them. The next thing that enterprises need to find out is where to place personalized content on their websites. Identify the pages that you should be running your personalization campaign on. Should it be the product page that has a large amount of traffic? Probably yes. Should it be the checkout page for eCommerce? Probably not. Look at your website analytics data (in Google Analytics, for example) to identify pages that drive high traffic. You could also look at specific pages where the segments are browsing/arriving mostly. On your B2B website, whether the eBook you have targeted to get more sign-ups from your eCommerce clients should be placed in the middle of the website scroll or pushed to the top. On your eCommerce website, whether you should place the lookbook for your fashion-oriented segment of women on the top of the page or on the left. The first step is to set up target segments within your personalization tool. In VWO, for instance, you can either choose a predefined segment or define a custom visitor segment for different variations. 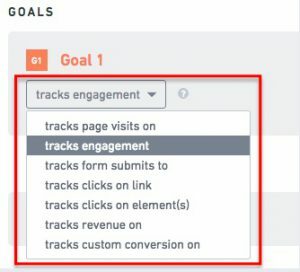 Next, set up a conversion goal that you want to track on running the personalization campaign. Tracking CTA clicks on a variation that has been personalized or tracking revenue from the personalized home page variation created for business-class travelers—the goal should be exactly what you want to achieve with your personalization efforts. When the segmentation is applied to the created or modified variations, you are ready to run your personalization test campaign. A/B testing is one approach to measure the success of your personalization campaigns. You can run your personalization campaign as an A/B test. If your campaign delivers a win, you should replicate its success by planning and running more campaigns on similar hypotheses. If it fails to achieve the goal, identify and record the reasons for what went wrong. Maintaining a repository of learning is essential to refrain from committing the mistakes of past A/B tests and running smarter campaigns in the future. Google Analytics conversion funnels also can help measure the impact of personalization. To see how successful you have been in your personalization efforts, compare your target metrics for the period before you implemented personalization with that of the period after it. Gauge the same conversion funnel for the same amount of time, and see the difference in results if any. Running personalization requires enterprises to answer a number of questions regarding for whom and why the personalization campaign being run for, how and where on the website will the campaign be run, and what results will the personalization efforts reap. With our 4-step approach to personalization, you can effectively implement your campaign. Are you personalizing your CRO campaigns? Share your experiences with us in the comments below.